Strona główna pokazuje jedynie wątki publicznie dostępne. Część flag z nowych działów była nieprawidłowo ustawiona. Powinno być poprawione. Statystyki forum zostały ponownie przeliczone. W przypadku stwierdzenia jakiś innych nieprawidłowości - proszę o notkę w tym dziale. Ability to create and manage advanced logical structures. Ability to programme and use scripting languages. Knowledge on essential web integration. The ability to programme a code that works on many threads. Those, who are interested, please send your application (with portfolio) to rekrutacja@enidust.com. Due to safety reasons, please send your materials as links instead of attachments (just to make sure that we receive your work). Applications without exemplary works will be rejected. Considering the fact that we try to examine every application, please make the email cohesive. We would like to inform that people who already work on the project do not receive any material benefits for their involvement. 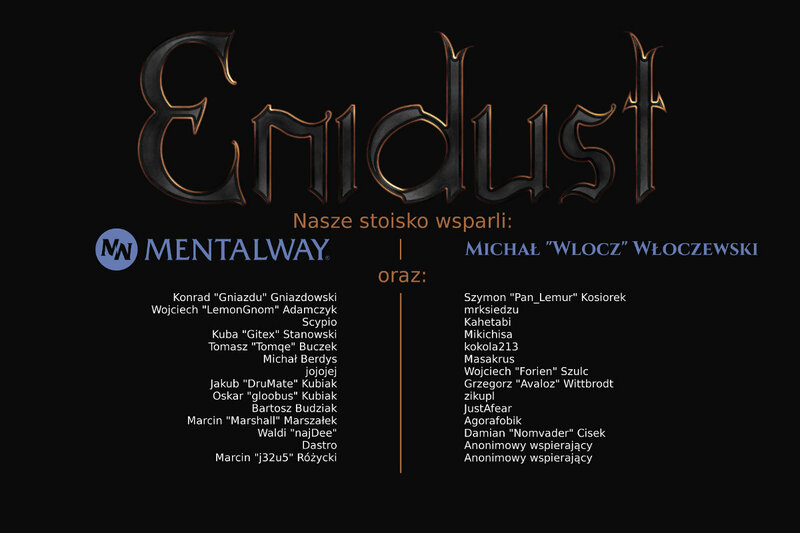 In order to obtain information on Enidust, visit our webpage: www.enidust.com. The ability to create low poly objects and textures and normal maps for them based on your own high poly models.